Crater Lakes (Fort Portal) in Uganda. Useful information for independent travellers. (8 months), through Southern and Eastern Africa. If you are planning a budget trip in Uganda, here you can find useful information to visit the Crater Lakes, in a independent and low-cost trip. The area is around 20-30 km south of Port Portal. Fort Portal is a noisy town, with main roads and traffic crossing the center, good to do some shopping (supermarkets) and much better to head sleeping to lakes, even if it´s more expensive, it´s quiet and rural area there. Many small crater lakes in the area, spread out on many km. There are camps in some lakes. Choose a camp and lake in advance, to decide where you are heading, specially if travelling by public transport. Accommodation is not always cheap and affordable, there are also many luxury lodges (a double room can even cost 300-500 $!). It´s better you have an idea! No local lodges in the few small villages, so you have to sleep at the camps near the lakes. It´s a very rural area, only small villages. No banks. Bring enough cash from Fort Portal and buy what´s needed in advance. 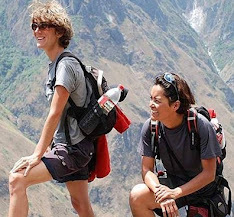 Walk around, you don´t need any guide (most of the lodges organise walks, paying extra). 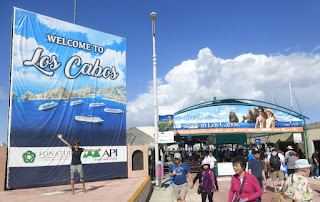 It´s really easy to walk around, wherever you go it´s nice and always friendly people and houses to ask for directions. As there are lakes close, walking around you can see a few ones in one day. Just look at the map we´ve done to have an idea. Visit the expensive lodges or camps. Usually they are in beautiful locations and have good views. It´s free to enter and the staff is nice (most of them). Swimming in the lakes? We didn´t see anyone inside, even local children. Some lakes are quite muddy or have vegetation around. And there are hippos too in some. Camping is the cheapest accommodation option in the area. Budget camps will allow you (there are just a few, detailed latter, this will limit your choice really). They also offer basic bandas (huts), with shared wc. You are in a rural area and budget camps have "African” style WC, just a hole (most of the times smelling). Showers are often rustic but ok, not hot water. There are also self-contained cottages, with better toilets, but not that cheap. Not too much electricity, only solar panels most of the times. The camps don´t have a kitchen for guests, but they offer food. Usually you have to order a few hours in advance. Prices are not so cheap compared with local Uganda restaurants, around 10.000 Sh for a super simple dish and much more. Bring some food, just in case. In the small villages in the area there are simple food stalls, local restaurants and small shops. If you are a budget traveller, we recommend you to stay at the Nkuruba Lake. There are 2 camps side by side, the cheapest in the area. Easy to reach by public transport. And you will be surrounded by wild monkeys, the beautiful forest around is their home. Good location to walk around. After exploring in the area, we think it´s the best choice. Nkuruba Lake is 2 km north of Rwaihamba (small village, north-west of Crater Lakes area). There´s still some jungle around the lake, you can walk around and enjoy watching the different kinds of monkeys. Great! There are 2 camps, sharing the same fence and lake, quite similar, but different prices. Often, cause it´s written in both "Lake Nkuruba nature reserve", same names, travellers can get confused. 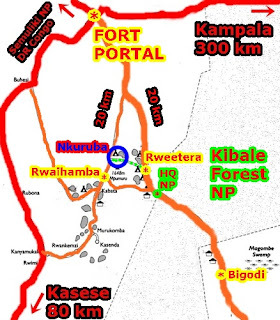 So, the first one coming from Fort Portal is the Nkuruba Campsite and few meters south is Enfuzi Campsite. Enfuzi campsite: the cheapest option in the area. - Camping is 5.000 Sh/pp (2€). - Double Banda: 15.000 Sh/pp (5€), shared WC. Beautiful place, quite well maintened. Good bandas. Rustic toilets but OK. They can prepare food. The staff is nice. Nice walking around the lake and many monkeys! Pastor John Bosco (pastor.bosco@yahoo.com, +256(0)782.779.910), the owner, is also in Couchsurfing. He opens his own house to travellers. We stayed there with him and he let us use the facilities of his camp for free!Thank you! Nkuruba campsite: the other option. Similar to the other but much more popular on the guide books, so good excuse to charge almost double price. Just check before! Extra; they have self-contained rooms, but the price is not really for backpackers and low-cost travellers. - Double Banda: 26.000 Sh/pp , shared WC. Prices: 10.000 Sh for camping/pp, 20.000 sh/pp for a banda (shared WC), 70.000 sh for double self-contained cottage. Not far. We didn´t checked. South of Rweetera (northeast area). On Lake Nyabikere (just south of the village). There are 2 camps sharing the same big lake (swamp). Rweetera Safari Park. camping, tented room, shared Wc room. Walk… walk… walk… Rural, hilly and discovering lakes. From Lake Nkuruba you can walk south and discover a few lakes (Ndali Lodge area). Or walk east, to Rweetera and the lakes around.You can take a boda-boda, if you don´t want to walk, always a few around. Don´t expect too many original forest. Plantations and fields, and rural houses. Just some "jungle" near a few lakes. Visit the expensive lodges or camps, it´s free and it´s a good option to see lakes. Spot monkeys, specially around Lake Nkuruba, the best spotting place we found even on the main road ( they are path around go down to the lake, if entering from the camps maybe small fee). Just a few ones around Rweetera, at Lake Nyabikere. Also many birds, if lucky, you will see the beautiful turmaco (we saw one!). We didn´t see local children or people swimming in the lakes, some are quite swampy. They say it´s not very recommended as there´s bilharzia… and also hippos in the area. Visit Mahoma falls (probably not too special...). From Kifuruka campsite, they charge you 15.000 sh/pp to get there (return 3 h). We didn´t go. Get to the "Top of the world", in our opinion a tourist trap. We just pass near the path heading there (not far, east from Nkuruba, in fact we saw a few sings... so maybe "tops"...where they probably ask for a small fee). It´s just an hill, with easy access and there are no lakes around for the views.here you can´t see any lake. We didn´t go to the top. Tea plantations: around Rweetera, north, there are tea plantations (not too special). Also a few on route to Fort Portal (and many from Fort Portal to Kampala). 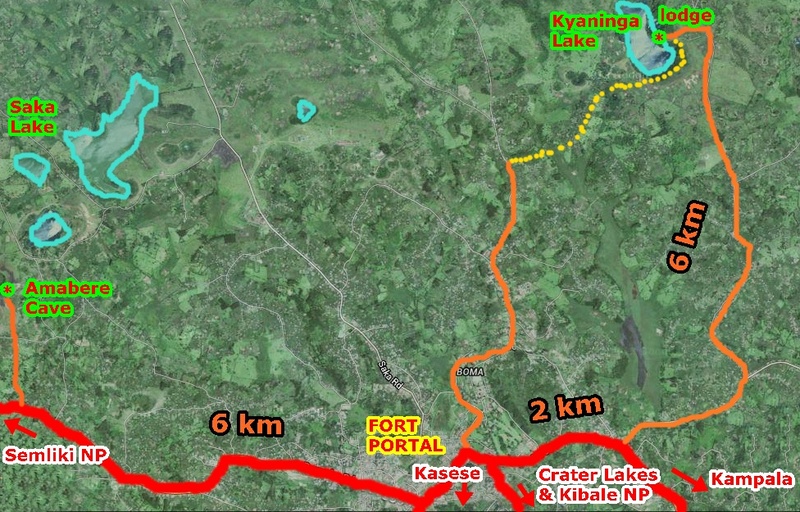 The main access road to the Crater Lakes is from Fort Portal. Big town, crossed by main roads, so it´s really noisy. No special reason to stay there (calmer to head to the Crater Lakes, 20 km south). Just a place to do some shopping ( there are a few supermarkets) to break your journey. Kasese, 80 km south, is much nicer too and gives you access to Queen Elizabeth NP and great views over Rwenzori Mountains and lakes. If you want to stop and sleep in Fort Portal, you have cheap options, and prices are cheaper than at the lakes´camps. The Rwenzori mountains from Fort Portal are not as impressive and high as around Kasese. You will not see tea plantations just around Fort Portal. 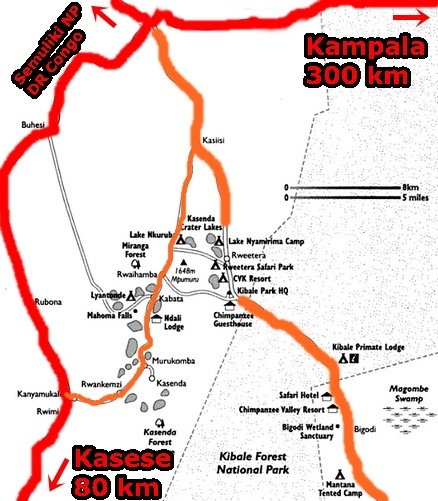 They are a few km east, on the Kampala Road and also south around Rweetera. 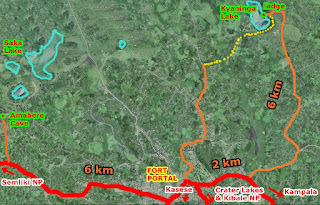 Note: if coming by private car from Kasese, there are roads heading directly to the Crater Lakes area without passing Fort Portal, ask the locals on the way, if the roads are fine. No bus station in Fort Portal. Kalita and Link are the 2 main bus companies passing the town. Different offices and stops, in the center. Taxis and matatus have different stops depending of directions. Ask around. Transport Kasese - Fort Portal. Big bus, 5.000 Sh, 2 h.
Many, every two hours more or less, different companies. Most do Kasese-Fort Portal-Kampala. Also matatus, a bit for expensive (max. 7.000 Sh). Vans and buses, for 20.000 Sh, 5 h.
Shared taxis. Price: 4.000-5.000 Sh, 45 min, for the area around Rweetera or Rwaihamba. Don´t pay more than 7.000 Sh if going further south. Be patient as they leave Fort Portal usually when full. 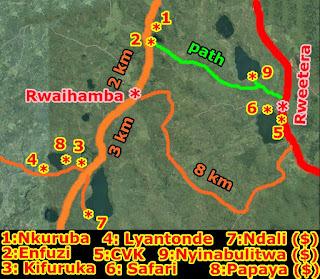 The cars leave from the market area (north of the center), where the Crater Lakes junction is. Or just ask any public van or car around town. The other option is hiring a special taxi (they are around the roundabout, Continental Hotel).More expensive. Boda-bodas are quicker to get to the area, but a bit more expensive (6.000- 7.000 Sh) and not so safe (the lakes are around 20 km south of Fort Portal, the road is under works and then dirty roads). Monday and Thursday are market days in Rwaihamba, so maybe quicker to fill a car, in that direction. The way back from the lakes, don´t worry. There are always cars in the area, better ask at the villages or your lodge. And always many boda-bodas around. Most of the camps are walking distance from the roads where the vans/cars stop. Note: they are renewing the road from Fort Portal to Rweetera and Kibale (april 2015). So maybe soon, it will even be soon tarred. 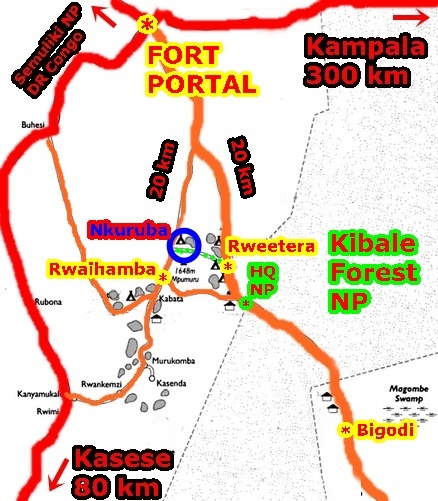 To Kibale NP, Rwaihamba (west) and Rweetera, Kanyanchu (east), matatus leave from near the market. To Semliki (Ntoroko, Bundibugyo), the vehicles (matatus, taxis) depart from down of Barclays Bank on the road heading west. Maybe also a few buses, ask around. Many cheap lodges in the center, most of them quite noisy near the roads, many of them with a pub downstairs. Check first, as the quality varies, some very basic, others are OK. Double room: 30.000 Sh, self-contained. Also rooms with shared WC, cheaper. At the roundabout, the front rooms can be quite noisy. Just recently painted, the rooms are clean and good, even if the staff is “distant”. Double room: 25.000 Sh. Basic, self-contained. On a back street, just behind Rwenzori Travellers Inn. Double room: 65.000 Sh, B&B. More comfort but maybe also noisy, at the Kasese entrance in town. They sell good maps of the area and you can have a look at them on the wall. Outside the center, other lodges... you will need a boda-boda. Focused in foreign customers, more expensive. Not too many options in the center if you don´t want to eat in a dark and wet room, and even more limited on Sundays. Dinners Cave is one of the cleanest places with the normal cheap local food and also tourist dishes. Just on a small alley right of Kalita office on the main road. Recommended! In the evenings (around 18:30), chicken BBQ and rolex-chapatis just near the Total gas station and roundabout. Many shops and supermarkets on the main road between the roundabouts. The market is north of the center. At least a couple of banks with international ATMs, internet shops, pharmacies, etc. Fort Portal is quite spread out and the center is ugly. The Rwenzori mountains are less impressive than around Kasese. Going to the market you can see a big mosque. In our opinion, the best thing to do is walking in the surrounds, hills and also a couple of lakes (many more around the Crater Lakes, 20 km south of Fort Portal). The area is nice. Visit Kyaninga Lake. There´s an expensive lodge (300 $) but you can enter (free) and walk around the lake. Very beautiful crater lake, hills and the Rwenzori. It´s around 8 km from town. You can take another way back to town, more direct, getting to Boma neighborhood. Just ask the staff or local people. Nice loop, but better to take a boda-boda on the main roads (too long). To visit Tooro Palace you have to pay 5.000 Sh. Just concrete round building over the town. Karambi Royal tombs (5.000 Sh), 4 km south. Also Saka Lake and Amabere Caves, 25.000 Sh fee. 6 km west. It´s maybe better to take a boda-boda and then walk around. We didn´t go. Chimpanzees and primates in the tropical forest. Chimpanzees tracking: 150 $ (guide + park fee). Expensive, compared with Queen Elizabeth area. Tip: you can walk on the main dirty road Fort Portal-Rweetera-Bigodi that crosses the national park, for free. And maybe you will see any! Southeast of Kibale (around 40 km from Fort Portal), walks in the swamp. Now it seems that only guided walks (fees), to see the birds. A few camps around. Beyond the Rwenzori Mountains, at the border with Congo. Tropical forest area, river and swamps. 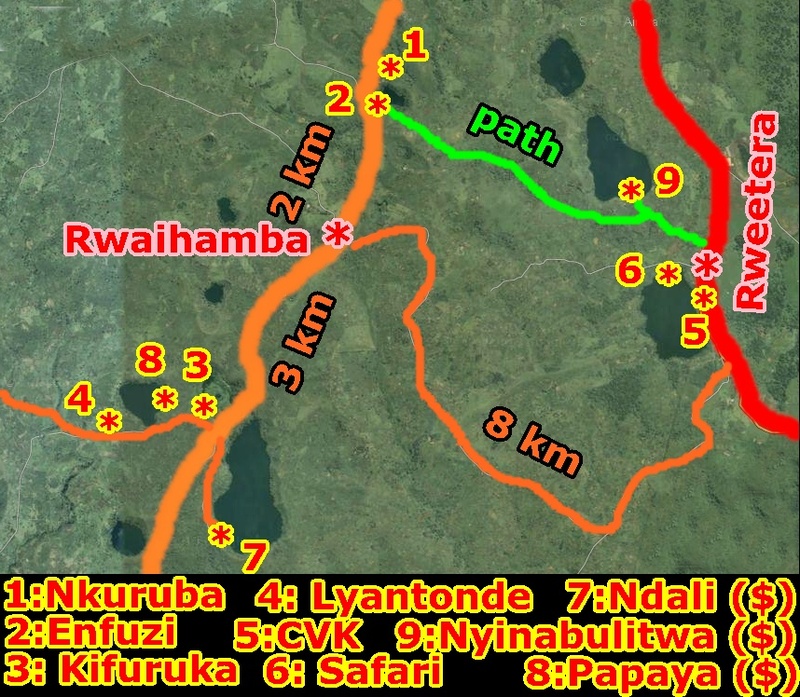 Access from Sempaya, 55 km from Fort Portal, tarred road (passing Karugutu and Buranga Pass). Hot springs. To sleep there, the UWA has campsite/cottages, 2.5 km from Sempaya. 25 km further is Bundibugyo (new tarred road, 80 km from Fort Portal), where you find local accommodation. Then Nyahuka (falls) and Lamia border (Congo). There´s a trail to cross the Rwenzori, Bwamba Pass Trail, from Kichwamba west of Fort Portal to Bundibugyo... but we didn´t find the mountains so impressive here. No fees (it´s outside the NP). Far away, as access is from Masindi, around 250 km north of Fort Portal. But going north to Hoima-Masindi (250 km), roads are dirty, not good. So it´s much better and will take you same time but on tarred and good roads going via Kampala, through tarred roads (Fort Portal-Kampala 300 km, Kampala-Masindi 200 km). Anyway, it´s a long way! The park is in a remote savannah area, the Albertine Rift Valley. 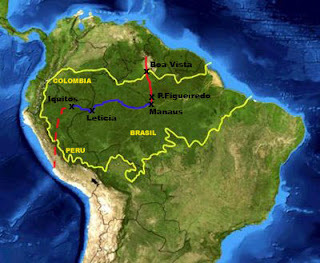 It´s the Victoria-Nile river and Lake Albert area. The Victoria-Nile river plunges 45 m, creating the falls, the most visited place in the park, where the tourists do a boat cruise (30 $/pp for 3 h). It´s also a game reserve with birds, elephants, giraffes, buffaloes, hippos and crocodiles where you can do game drives (Buligi area is famous). Entrance fee is 40 $/pp. Different gates, coming from Masindi, Lira, Gulu, Arua. Ferry crossing at Paraa is 5.000 Sh/pp (no bridge), managed by UWA, just north of the falls. Different camps in the area, also UWA accommodation. The cheaper option is camping, usually around 10$/pp. Also many expensive lodges.